What Others Are Saying About Us - Star Drive Wood Screws - Screw Products, Inc.Star Drive Wood Screws – Screw Products, Inc. I have begun using your screws in my products and my customers really love them. I use them as my standard line fastener since they are the least expensive of the three fasteners I use (yours, solid cut thread brass and silicon bronze) but several customers have said they like the looks of them as much or more than the others. They are also great in the shop. Easy to drive. Almost never cause splitting and I have only ever broken one when I inadvertently drove it into a not in a piece of birch. Thank you, I enjoy doing business with you people and recommend your products to all those I work with. Professional carpenter for 22 years. Other screws do not compare. Far from home on a job,, I let my box of Bronze Stars run dry. I had to go to [major large hardware store]. [major large hardware store] Star drive screws are less expensive but [major large hardware store] screws frustrate me horribly. The thread length on [major large hardware store] screws goes too close to the head of the screw which makes the [major large hardware store] screws have no pulling power when trying to fasten 2x lumber. You have to sink the head of the [major large hardware store] screw 1/2"+ before it will begin to pull the 1-1/2" thick pine to the joist. The [major large hardware store] screws put much more drag on a drill driver and carpenter. Screws from Screw Products are noticeably superior to [major large hardware store] screws. Screw Product's start easier, pull much, much better, create much less drag on drill and carpenter, and they come out much, much cleaner and easier when you need to back up and adjust. When you are happy to back up and adjust, your End Product will be much better. Don't let your box of Screw-Products' Star Drive Screws run low. Always keep a spare box in reserve. You can never have enough. These screws may be a bit more expensive but they will really save you time and frustration and your End Product will be better. I really appreciate the high quality of Screw-Products. Their Customer service is Fantastic. Their product knowledge is perfect, they are always kind and helpful, and they always ship to me the same day I order. Don't hesitate. Enjoy your work! I got one of your company caps at the remodeling show in Chicago. It's probably the coolest hat I've ever owned; the camo-cap with your logo. How do I get more? You should offer them on your website!! I have been remodeling kitchens and bathrooms for years and have always struggled to find good quality cabinet screws in stock at local hardware stores. A few years ago I came across Screw Products, Inc. on the internet and decided to give their CTX Gold Star Drive Cabinet Screws a try. By the time I used the first screw installing a kitchen cabinet I knew I had found the best screws for our companies needs. I now order several sizes of the CTX cabinet screws by the 5Lb container. A few months ago I asked my online dealer, ScrewSolutions, about framing screws that use the star drive and they immediately sent me some free samples. I was so happy to learn they are superior to standard philips drive framing and general purpose screws that now I only buy Screw Products, Inc star drive screws for all of our projects. They save us time, bits and frustration… well worth their cost! I have been installing kitchen cabinets for the last few years and had started out using the square drive screws that came with one of the brands of cabinets I install. I had ran down and almost out and was not going to pay the prices that they wanted. So I hit the internet. No luck with what I was looking for in the square drive. 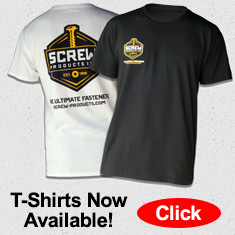 Then I found SCREW PRODUCTS, INC.'s web site and order a couple to just try them out. Well I have been hooked ever since. I use every size screw from #8 - 1" to #10 - 4" for everything. I even went through an 18v Ryobi drill that couldn't keep up and had to replace it. I could not be more impressed by a product. I have homeowners looking at the installations and see these screws and they are also impressed by the speed I am able to put these kitchens together and the strength of these screws. Thanks again, A devoted customer. I have been using the Star Drive screw for over 20 years for my business and personal projects. Once I started using the Star Drive screw, I immediately threw out my Square and Phillip’s Drive screws. Screw Products, Inc offers a much needed variety of different size screws and Star Drives for different applications. I find myself using more of their Star Drive screws than nails in my building projects. I also use their assortment of cabinet screws for finish carpentry. Working with these screws makes for a more efficient, quicker job because you never have to pre-drill before inserting the Star Drive screw. I use the larger lag screws from Screw Products Inc. when building log homes, instead of the conventional lag bolts. I also use the star drive exterior lag screws for deck applications, instead of nails. I will never go back to any other screw; Screw Products Inc. offers the best screws available. My employees tell me that driving them is much easier on their arms and shoulders with virtually no pushing needed to keep the bit in the head of the screw. They also say that the screws back out as easy as they go in, which allows us to reuse them. They have yet to have a head twist off, strip out, or a screw break. Most contractors would agree, that not a day goes by without one of those things happening. I see this as a cost savings to McFarland Cascade. We will highly recommend your Star Drive Wood Screws to all the contractors and do-it-yourselfers. I only wish you would have come out with these years ago. I tested them in 2 inch solid hardened mahogany (used in rail car decks). All other screws broke as soon as the screw head met the deck or they snapped off as soon as I tried to remove them. The gold star screws however, not only didn't break but they counter sunk themselves one inch below the surface and I was still able to remove them without one single breakage. At first I thought I couldn't afford the best, but in reality I can't afford to use anything but the best! ...And a Merry Christmas to all of you too! You guys are one of my favorite businesses and I wish you a very Prosperous New Year. You deserve it! , A great product and dedicated customer service. A couple hundred MBAs could learn a lot from each of you! Those screws are awesome. I have searched everywhere for a screw that works well on tongue and groove knotty pine and all of them have issues. These screws are just awesome. They work great! Thanks! I like many others have suffered through different types of fasteners, from modified phillips to square drive looking for one that worked as advertised. Since I discovered Screw Products, I have found a fastener that works every time. From cabinets to decks your products are always my first choice. Thank you. I have been building decks and other outdoor products. The deck screws I was using previously were mostly Phillips head screws and hard to drive in correctly. Too many pilot holes to drill which really slowed a project. I recently had a rather large outdoor garden to build using pressure treated lumber. I visited my Do It Best hardware store and found the screw I thought would do the job. The screw was the HDB104. The screw with the T-25 head was a real pleasure to use. The screw DID NOT slip while driving it home. Pilot holes were not needed. The screw pulled tight every time. This is the screw I will be using for other projects that come up this year! My overhead model train display is supported on the wall with horizontal stand-off made out of plain 2X4 stock tapered on a table saw. The standoffs were then bored with a shipwright’s auger. The outer ends of the brackets were additionally over-bored to provide a shoulder for the screws to pull against and to accept a finishing wood dowel plug. The standoff brackets are bolted solid to the existing wall studs and are very secure thanks to your quality screw products.